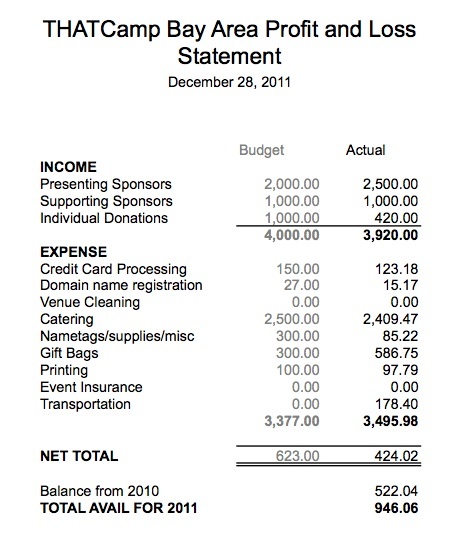 Just in time for the end of the year, here’s how the finances of THATCamp Bay Area 2011 ended up. Thanks again to our amazing sponsors for making THATCamp Bay Area possible, and to all of the individuals who contributed money and/or ideas to make this year another great event! The good news on the money front is that we broke even again and have a little extra money in the coffer for next year. Based in New Orleans, Jon is the Strategic Partnerships Director at Historypin.org, a global non-profit project that is creating innovative ways to help people build community around local history through intergenerational and intercultural community memory. He's helping to build an open ecosystem of historical data across libraries, archives, and museums worldwide through his work with Historypin and as the co-founder of the International Linked Open Data in Libraries, Archives & Museum Summit. In 2016 he co-founded the Cultural Heritage & Social Change Summit. Jon organized the first THATCamp Bay Area in 2010, hosted by WordPress, and talked Google into hosting THATCamp Bay Area 2011, all made possible by an amazing group of co-organizers and sponsors.